Kris Kobach: Yes, I'm On Breitbart's Payroll - Joe.My.God. Kansas Secretary of State Kris Kobach is now a regular columnist on the far-right news site run by President Donald Trump’s former chief strategist. Kobach, a candidate for Kansas governor who is running on a platform of combating illegal immigration, published his first article for Breitbart.com in June — a piece that tied refugees to terrorism. Four of Kobach’s seven pieces published so far have focused on immigration policy, including his Wednesday column which was marked “Exclusive.” He called for Trump to end Deferred Action for Childhood Arrivals, an Obama administration policy that has allowed people who entered the country illegally as children to avoid deportation and obtain work permits. “I get paid for my columns … just like you’re paid,” Kobach said when asked about compensation without specifying the amount he receives per column. 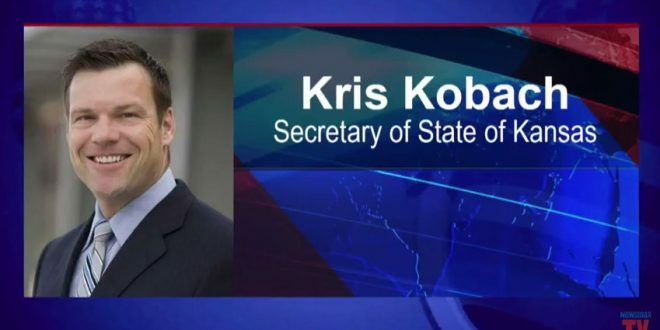 Kobach repeatedly rebuffed his Democratic opponent’s calls to release his tax returns in the 2014 secretary of state’s race and disclose his income from sources outside his official duties.